It’s one of my comfort foods, the risotto. I’ve become very fond of this classic dish over the years, possibly because it’s a fairly quick, easy meal that can be rustled up at a moment’s notice. A plain risotto bianco is hard to beat I reckon, especially when served alongside a simple green salad and a glass of crisp white wine. And it only takes a little more than 30 minutes from start to finish. This risotto is a little more involved, however. It’s a proper winter dish, making good use of cavolo nero, that classic vegetable so loved by the Italians, and tough winter herbs thyme and rosemary to give a depth of earthiness. Cavolo nero has wonderful textured leaves that are strikingly dark green, hence its English name “black kale”. The more nutrition-conscious out there will know of its status as a superfood, but it’s also got an intense savouriness that goes perfectly with something bold like a risotto. I fried some in hot oil until crispy, and sprinkled it with sea salt. A perfect garnish for the risotto as it adds a nice bit of texture. Be careful when frying it though because it will sizzle violently! For this recipe you’ll need 3 pots; one for the risotto, one for the chicken stock and one for the fried cavolo nero. If you’re organised though you could fry the cavolo nero beforehand and wash the pot. The secret to a good risotto is to stir it continuously as the rice is cooking. This is the only way of getting the ultimate glossy and thick texture. So we’ll measure all the ingredients out and get everything chopped before we start. Pick the leaves from the thyme, being careful to leave behind the woody stalks. Place them in a bowl, then pick the leaves from the rosemary, and chop them finely. Line up the long rosemary stalks in batches, which makes for easier chopping. Add to the bowl with the thyme. You should have approx 2 full tablespoons of chopped/picked herbs. Remove the tough central stalks from the cavolo nero leaves. Take approximately a third of the leaves and cut them into roughly squares. Roughly chop the rest of it into small shreds. Bring the chicken stock to the boil. Make sure your garlic and onion are finely chopped, ready to go. The final preparation step is to fry the squares of cavolo nero for our garnish. In a medium high-sided pot, add vegetable oil to 1cm depth and place over a medium-high heat. Wait about 3 minutes for the oil to heat up (might take longer, depending on the size of your pot), then add the cavolo nero. It will spit hot oil at you violently; be careful! When the cavolo nero has almost stopped sizzling, it’s crispy. Remove from the oil with a slotted spoon or spider and drain on a plate lined with kitchen paper. Now, to start cooking. Place a medium high-sided pot or pan over a medium high heat and add the olive oil. Wait until the oil is hot, about 1 minute, then add the onion and garlic along with a pinch of salt. Immediately turn down the heat and cook slowly for about 15 minutes, stirring occasionally, until the onions are soft and sweet. This is the soffrito. Now turn the heat to high and add the rice. Stir vigorously for about 30 seconds to coat the rice in the flavour of the soffrito, then add the wine. Turn the heat to medium-high and continue to stir until all the liquid has gone. From this point the risotto will take about 15 minutes. Set a timer for 10 minutes, which is when we’ll add the shredded cavolo nero and herbs. Continue to add the chicken stock, 1 ladleful at time, stirring continuously to massage and coax the starch from the rice. This creates the heavenly unctuous sauce of the risotto. When the timer goes off, add the shredded cavolo nero and herbs. Stir, and continue cooking. After about 15 minutes, the risotto should be ready. When you taste a grain of rice, there should be a slight bite to it. If it’s still quite hard, continue cooking for a bit longer. Add the baby spinach and stir until it’s wilted. Turn the heat off, then add the chilled butter and parmesan gradually, whilst beating the risotto to emulsify it into a lovely creamy texture. If it seems too thick, add a bit of stock. As Giorgio Locatelli says “It should ripple like waves on the sea”. If you run out of stock, just use boiling water. 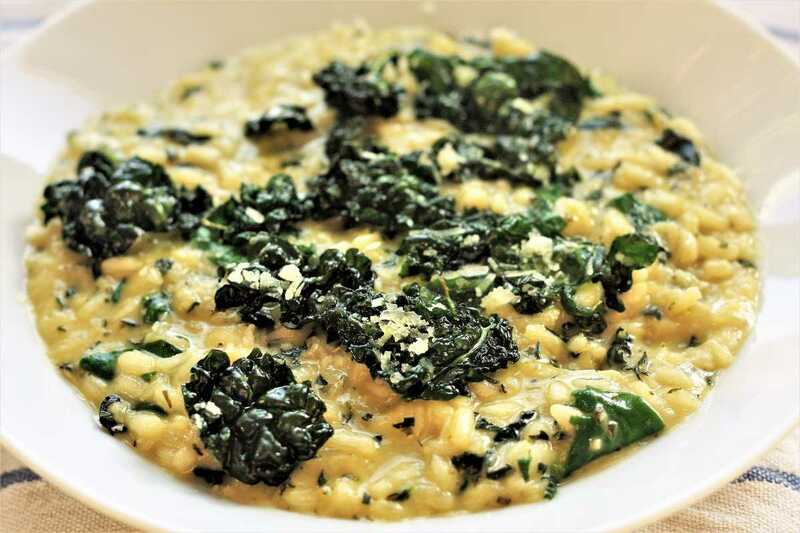 Portion the risotto into bowls and garnish with the fried cavolo nero. The risotto does not keep well, so eat immediately.